All across Spain you’ll often find that each city has their own principal public park, usually established a century or two ago and which functions as the city’s backyard. For example, Madrid has the Retiro Park, Sevilla the María Luisa Park, and Barcelona the Parc de la Ciutadella. 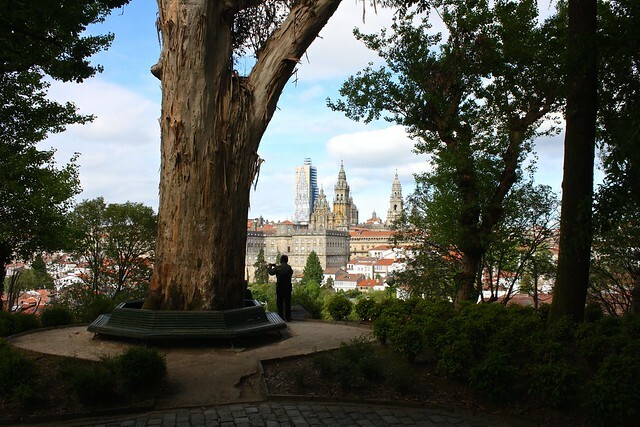 Santiago de Compostela is no different; its Alameda Park—just to the west of the old historic core—is where the whole city comes out to go for an afternoon stroll or a late-night jog, or to simply get a breath of clean, tree-purified air. Built on land that the Counts of Altamira donated to the city in the 1500s, the park’s three main gravel avenues trace around a small hill, upon which hundreds of ancient oak trees have taken root. 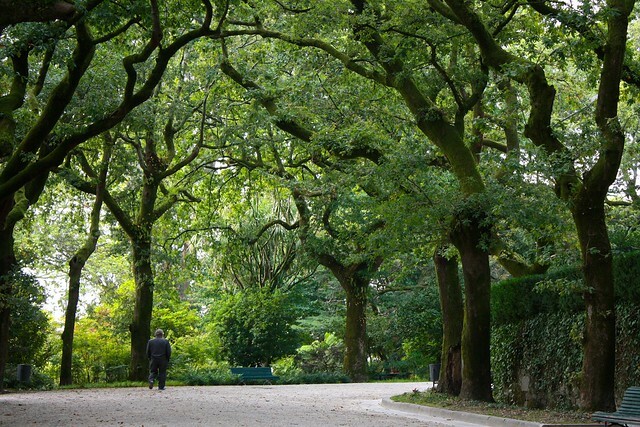 While the Spanish word alameda literally means “a place with álamo trees” or poplars, the term has come to mean any sort of grand, tree-lined promenade—which Santiago’s Alameda definitely fits. 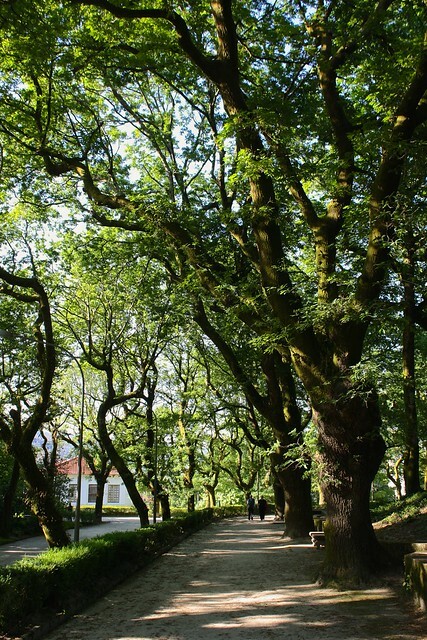 The Santiago tourism board describes the park as “pacego (adjective applied to the ancestral country houses in Galicia or pazos) because it was the recreation and leisure area of the city in the same way that the gardens of Galician pazos were areas of pleasure and enjoyment.” Envision the gardens of a palatial country estate, and you’ll get an idea of what the Alameda is supposed to be like. A handful of monuments dot the park grounds, commemorating Galician writers like Rosalía de Castro and Ramón del Valle-Inclán and also two of Santiago’s most famous citizens: “the two Marías.” Maruxa and Coralia Fandiño Ricart came of age during the Spanish Civil War, which divided the country along political, religious, and urban/rural lines. Francisco Franco’s nationalist Falange movement emerged victorious from one of the darkest moments in Spanish history and initiated a dictatorship that would last from 1939 to 1975. 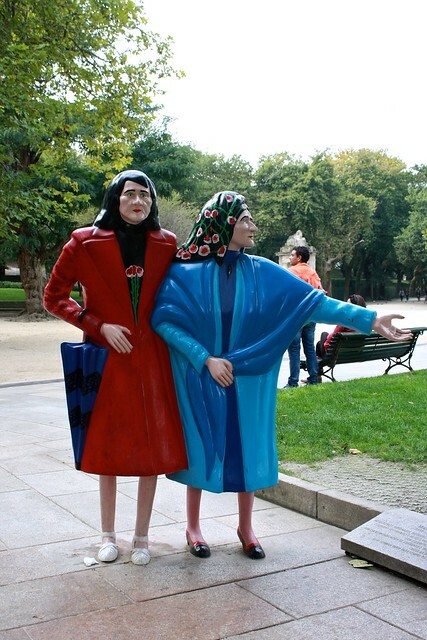 During this time, the two sisters—whose family had been persecuted for being left-leaning, or even anarchists—would go out for a stroll (paseo) at 2pm everyday, dressed up in bright colors and eccentric makeup. Sometimes they would flirt with male university students heading home for dinner…but they were generally a colorful contrast (a protest!) to the gray, conservative, conformist mood of the age. Although the cathedral of Santiago is currently under wraps for restoration (several centuries of moss, lichen, and mooching plants have taken their toll on the façade), the best place to appreciate some amazing views of the old town is at the mirador or lookout point on the east side of the Paseo dos Leóns, a two-minute walk past the triumphal arch entrance. Here you can take in the whole spread of the city, from the huge Church of San Francisco to the north down to the Zona Nueva, the “new town” to the south. What’s your favorite picture from this post? 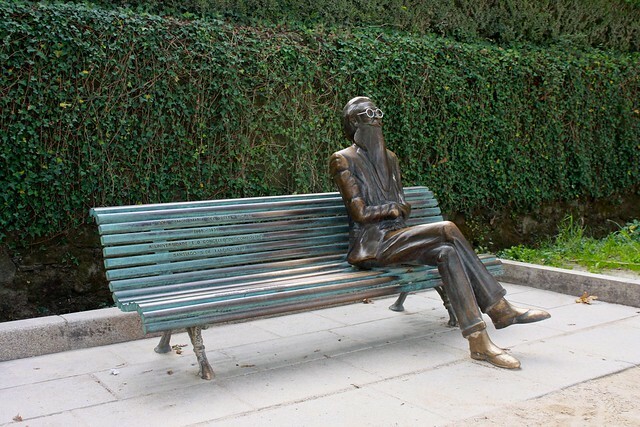 What public city parks have you enjoyed going for an afternoon stroll in? Tell me below in the comments!